The fledgling United States Mint opened in 1792 with a full complement of machinists, administrators and other sundry personnel, but it sorely lacked in artistic talent. After several years of negotiations, Secretary of State Thomas Jefferson’s attempts to hire French inventor Jean Pierre Droz, one of the finest engravers and coiners in the world, had proved futile. Mint Director David Rittenhouse appointed artist Joseph Wright as Chief Engraver in August 1793, but Wright hardly got started before he died a few weeks later in one of Philadelphia’s annual yellow fever epidemics. Desperate for an engraver, Rittenhouse engaged the aging Robert Scot, an English born watchmaker and banknote engraver. Unfortunately Scot’s limited talents as a die engraver, exacerbated by his advancing years and failing eyesight, provided the Mint with marginal designs at best. The logical successor to Scot’s post was John Reich. A refugee from the Napoleonic Wars, Reich had sold himself into indentured servitude to escape to America. By 1801, his reputation as an engraver had earned him a recommendation from President Thomas Jefferson. Reich was assigned miscellaneous jobs at the Mint, but in deference to the professionally territorial Scot, he was not allowed to design coins. After six years on the job, Reich’s considerable talents were going to waste, and he began to make preparations to return to his native Germany. It was at this point that Mint director Patterson intervened with a well-placed letter to President Jefferson, and Reich was promoted to Assistant Engraver at an annual salary of 600 dollars, half of what Scot was earning. Only 2,710 Capped Bust quarter eagles were struck from these dies, and no more quarter eagles were produced for more than a dozen years, making this date an instant rarity. Estimates are that fewer than fifty 1808 quarter eagles exist today in all grades. Most survivors are in the higher circulated grades, but several mint state examples have appeared over the years. Even among the low mintage quarter eagles, the 1808 is a very scarce date. But with so many collectors pursuing design types alone, this issue has assumed much greater importance than merely another scarce date in the quarter eagle series. It is one of the premier rarities in U.S. numismatics and undoubtedly one of the most eagerly sought of all type coins. These highly prized coins are held in major gold collections and rarely enter the numismatic market. No proofs are known and no special strikings are even rumored to exist. The finest 1808 quarter eagle known traces its pedigree to the collection of the famous Colonel E.H.R. Green, son of the notorious “Witch of Wall Street,” fabulously wealthy Hetty Green. Since the 1930s sale of the Colonel’s collection, this remarkable coin has been the cornerstone of gold collections owned by such notables as Jerome Kern, Dr. J. Hewitt Judd and Congressman Jimmy Hayes. Its last public appearance was in Stack’s session of Auction `84. Several circumstances contributed to the small mintage and subsequent rarity of 1808 quarter eagles. In the early years of the Mint, depositors of foreign gold or bullion could specify which denominations they preferred to receive. 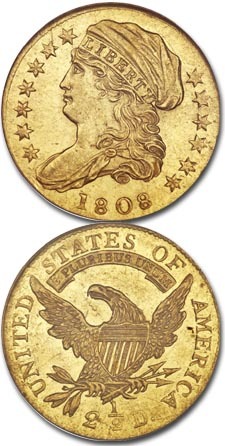 By 1808, only half eagles and quarter eagles were in production, and the overwhelming demand was for half eagles. Banks preferred the half eagles for international payments and reserves, and rarely ordered the smaller coins. As only one set of dies was prepared for quarter eagles in 1808, it’s obvious the Mint had no intention of striking any large quantities, but early die failure probably limited production to far fewer coins than officials had planned. All but one of the 1808 quarter eagles known today show a die break on the obverse from the cap through the stars on the right. As this fracture progressed, most likely the die broke and came apart, stopping production at that point. With no replacement dies, no more quarter eagles could be minted, and the minuscule demand for the denomination didn’t justify preparing new dies. Demand remained almost nonexistent until 1821, when some small orders for the denomination were again received. No hoards are known of 1808 Capped Bust quarter eagles and no reasonably convincing counterfeits have surfaced over the years. These coins are invariably weak at the rims and softly struck on the peripheral stars. Because of this, care must be taken to differentiate actual wear from the effects of a weak strike. On the obverse, friction first begins to show above the eye and on top of the cap. Wear on the reverse is first evident on the eagle’s wingtips and talons.